CMDR’s Log, 3305.03.17, Sol Calendar; I probably shouldn't be documenting this in my logs. It could very well be tracked. And even if it isn't, it will likely be confiscated and redacted when this is all over. But i don't care. I need to talk about this. I stepped onto the bridge of the Skies of Africa yesterday to find our cat, Jolie, spread out on the deck as if she owned it. Sleeping like a baby. I wish that I could sleep half as well. Neither I nor my wife have slept soundly in months it seems. When she's not tossing and turning in our bed, she's on the bridge manning the consoles or in the engine room tinkering with the SOA's innards. And I'm much the same. And I don't think that the proverbial skies are going to clear anytime soon. On the contrary...it will likely get much worse before it gets better. All of our plans to explore the galactic centre have been put on an indefinite hold by the Federal Navy. Understandable with the Thargoids pushing ever deeper into human controlled territory. The Federation believes that they may be making a play for Earth. And we can stand by and let that happen. We can't allow them to take our home. We were both pulled into a meeting with the admiralty and given the opportunity to volunteer for task most important: The Federation needed better technology than what we currently had to deal with the looming threat. And to that end, aside from the new tech that the bubble's technology brokers were dreaming up. it was decided that better shielding was a top priority. And nobody has better shielding technology then the Prismatic Imperium. 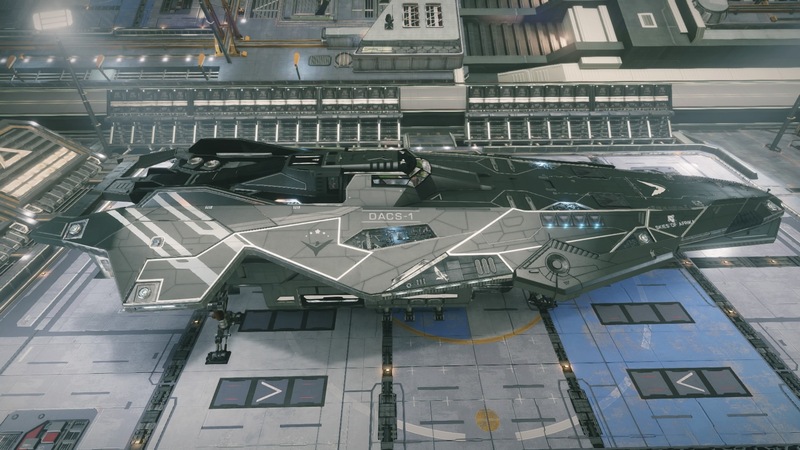 Our Anaconda, with its heavy modifications and classified hybrid alien technology, has the distinction of being one of the most advanced privately owned vessels in the bubble. And because it's privately owned, it can't be directly tied to the Federation proper..so we were asked to defect, pose as Imperial sympathizers, gain the trust of the Empire, and get our hands on prismatic shielding technology for the Federation to reverse engineer. Needless to say, we both hated this idea. But we're nothing if not loyal to our home. So now here we are. Wearing the Imperial flag on our jumpsuits, flying Imperial colors on our ship, and feeling wholly like traitors despite the fact that we're not.